Kataphraktoi are quite possibly the most armored horsemen in the world. Armed with a heavy mace they will thrash all enemies in its reach. These heavy axemen are descendants of the Varangoi. They are one of the Roman Empire’s finest troops, and their assault is legendary. The heaviest native spearmen/swordsmen the Roman Empire can field in battle. They are very valuable because they raise the morale of nearby units, as well. Pikemen that Manuel Komnenos’ created, they excell at containing enemy heavy cavalry but not much more. Mobile medium infantry armed with straight sword and javelins, strong on offense and in support of defending spearmen. Influenced by trade, the Italian crossbow was introduced to the Eastern Mediterranean. Enemy infantry will be worn down by its many armor piercing bolts. Ill-disciplined unarmored spearmen, best used on the attack or in support of more capable spearmen. Rugged light spearmen, capable in light defense as well as offense. Unarmored Axemen, lacking in staying power but swift of foot and good of spirit. Best utilized as light aggressive infantry, or in support of heavier allies. Medium Horse Archers armed with Composite Bow and Mace, capable in melee once their foe has been softened up. Light spearmen Akolouthoi aren’t soldiers per se, still if they have to fight, an iron helmet, a kontarion spear and a kite shield will do. Medium spearmen, they are equipped well enough, and fight well enough on many roles, but shouldn’t be left unsupported. Medium swordmen, a large triangular shield and paramenion scimitar allows them to hold the line. Heavy swordmen, their excellent armor, shield and morale allows them to be very dependable to not only hold the line but break through. Toxotai are archers. Good in their trade but should be guarded at all times as their lack of armor and sword, means that they will killed easily if attacked. Peltastai are javelin throwing skirmishers, who should be recalled once they unleash their javelins at the enemy. Menavlatoi heavy peltasts are equipped with heavy (boar hunting) javelins called Menavlion, who also double up as anti cavalry spearmen using their Kontarion spear and oval shield. “Trapezitoi” are horse javelineers, light in armor but very experienced in the throw of javelin. They are usually the first to engage the enemy in battle. Romanoi light horse archers. Armed with composite bow and spear, the unit is suitable for attacks on light armored infantry and cavalry units, or for harassment attacks against heavily armored units. Stratiotai, medium horsemen the are the mainstay of Roman cavalry, and are all purpose armored cavalrymen. Kavallarioi are western knights in Roman clothes. Great horsemen, they are the Roman Empire's best regular cavalry force, with lack of horse barding as their only impediment. Pronoiarioi are the Roman Empire’s heavy knights. A heavy lance and kite shield, barded horse and paramerion scimitar Pronoiarios on top of a semibarded heavy charger is a glorious sight. Lacking in any armor, these spearmen should only be used for defense in cities or to attack cavalry, not as a standing force. Loyal to their families and to defending their homes, these soldiers fight with spirit. Effective defensively or versus cavalry, but cannot stand under overwhelming missile fire. Quality infantry with sharp scimitars. They can wreak havoc in enemy spearmen ranks, but are vulnerable to a cavalry charge. Using their longbows, these young men are effective against most enemies. Light and mobile, the javelin is an ideal infantry weapon. These men can disrupt enemy’s ranks efficiently, but fear cavalry flanks. Lightly armored Spearmen of decent training and motivation. Kshatriya of the "fire sprung" clans, descending from Agni, the Hindu God of Fire. They fight only for those of their fire-borne lineage as rough-riding light lancers. Rajputs of the Chauhan clan astride fleet-hoofed steeds wielding sword and shield as zealous close quarters cavalry. Archers whose status atop Elephant Howdah affords them great range and accuracy upon their lower-borne and lower-standing foes. Commoners thrust into the lines with only a spear and weak shield to save their souls. Quick horse archers who are unarmored but can outrun the opposition. Light rugged infantry bearing axe and shield but limited motivation beyond a chance at easy plunder. Light-Medium cavalry, less eager in their service to non-Greek lords but far from irresponsible in their task as lancers who can either perform 'razzia' charge and retreat or something more dedicated. Light infantry armed with axes and broad shields. Archers from the hills of Anatolia, a mix of Christians and Muslims. Light-Medium Swordsmen well suited to fighting offensively. Medium armored mounted nobility of the low to mid aristocracy, armed with sword, bow, and shield to serve as rugged skirmishing cavalry. Weak archer cavalry useful for skirmishing. Finally able to afford good weapons, but still keeping light, these soldiers can deliver a surprising punch to enemy troops. Armored, motivated medium horse archers armed with saber, shield, bow and arrow. Still best served in a skirmishing role, rather than that of shock cavalry. Light javelin-bearing Irregulars with little more motivation than bandits, best served in guerilla warfare or idle harassment of the enemy. Armored archers from the ancestral homelands of Armenians, adept at marksmanship and limited melee. Georgian Militia and conscripted part time soldiers, equipped by feudal lord or invading power in cheap leather and mail to serve as light spearmen. Lance and bow armed heavy cavalry. A militia levied from the villages, farms and cities of the Islamic world, they possess fleeting discipline and moral and should be expected of little beyond the garrisoning of their homelands, or bolstering an army by sheer force of numbers. Undisciplined light infantry best used as throw-away warriors, garrison work, or a means to bulk up one's numbers. Provincial horsemen of various backgrounds fighting as light lancers, well suited to 'Razzia' charge-retreating or a sustained assault on horsemen of similar worth or disorganized infantry. Javelinmen from the hills of northern Iraq. Kurdish tribesmen of strong and reliable abilities, clad in medium armor and more than capable in close combat. Stoic, indominitable light camelry wielding bow and sword. Lacking in armor or steel weaponry, but fierce at heart, they throw showers of dangerous javelins at oncoming soldiers. Much more useful en masse. This unit of pressed men will rain arrows from afar, but in close combat they wont last long. These Afghan men grow their beards traditionally long and wear their customary robes. Armed with only an axe and a small wicker shield they fight with vigor. Excellent mounted archers with stunning speed on the battlefield and capable of striking from anywhere. Javelinmen who are able enough in a fight, just dont trust them to hold at crucial times. Agile hunters who excel at ambush in Afghanistan’s remote villages and hilly terrain. Brawny from years of farm work these levy axemen can present a powerful charge. Great for shocking lighter troops. Hearty, savage men, they are best employed in zealous assault against any enemy unwilling to face such a daunting charge. Unarmored Nomads used to tribal feuds and hunting, brave enough before they realize most every foe they face will be better armed and armored than they. Disciplined light/medium African Spearmen, reliable and durable as line infantry. The best heavy horsemen of the empire guard their Emperor. Defenders of the Roman tradition, their role in battle would be to guard the emperor or die trying. Saracen Militia are richer townsfolk who have been levied into militia to guard their settlements. Levies forced off their property to fight, but allowed to buy armor for themselves. Good against cavalry. Lacking in any armor, and lucky if they receive any training, these archers are not very useful. Good, faithful, landowning men. Have purchased armor and have previous archery experience. Good at harrasing approaching infantry. Lightly armored horse archers, best served to pepper the enemy with arrows before closing in with support from heavier cavalry or infantry. Disciplined and well trained cavalrymen from the lands of Syria. Motivated, well armored medium shock cavalry best served in fighting other horsemen. Drawn from the ranks of older, more experienced elders of the tribes of Arabia, they wield javelin and sword as skilled raiding horsemen. Medium cavalry armed with lance and sword. Medium Lancers, well served in a classic role of Near Eastern heavy cavalry. Silk Caravan stop encourages and accomodates the merchants trading on the lucrative silk route. A monastery allows the pious monks of the settlement to pursue their holy activies and offer services for faithful christians. 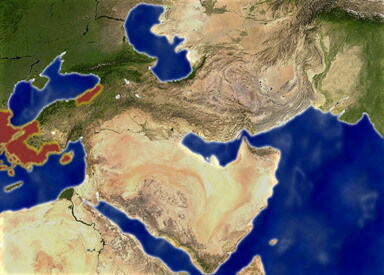 Accomodating and investing in trade across the mediteranean sea brings in great wealth. Vineyards are plantations of grape-bearing vines for the main purpose of wine-making.